The geisha's timeless vermillion lip remastered for the modern woman. Rooted in a shade that is one of the most distinctive, symbolic colors in Japan. Size: 3.7 g | 0.1 oz. The geisha’s timeless vermillion lip remastered for the modern woman. Rooted in a shade that is one of the most distinctive, symbolic colors in Japan. This feather-light formula combines brilliant pigments with pure silk and botanical extracts for a long-wearing matte finish that keeps lips hydrated. A universal shade that flatters all skin tones. Non-irritating. Non-sensitizing. Dermatologist tested. This feather-light formula combines brilliant pigments with pure silk and botanical extracts for a long-wearing matte finish that keeps lips hydrated. A universal shade that flatters all skin tones. Kyoto Red Silk Lipstick is rated 4.7 out of 5 by 61. Rated 5 out of 5 by Bev from Never Too Much Red Lipstick Love this lipstick! I was on the wait list and received an email that it was now available so I ordered it immediately. First, because of demand, shipping was delayed by 2 days so it was sent priority mail. How considerate. But to the lipstick - the best ever. It is creamy, but not so much that it gathers outside the lips. It is a matte which is great for daytime and with a sheer lip gloss, it transitions wonderfully into nighttime parties. It is not drying and because of the shade of red, it compliments many skin tones. The case is great because there is an indent to make sure the case closes securely. This is my everyday go to lipstick. Rated 5 out of 5 by Kim from Simply Stunning For reference, I have very fair skin and always wear lip balm under all of my lipsticks. I was worried this might look orange on me since I have a warm skin tone. However, it goes on as a gorgeous, classic red and somehow stands out from the other reds in my collection. The formula is opaque, yet lightweight and silky and wears for several hours. It arrived in beautiful packaging and is housed in a luxe, metal case. I never thought red would be my everyday, go-to lipstick, but I've worn it every day since it arrived. It adds instant glamour to whatever I'm wearing and I absolutely LOVE it!!! Rated 5 out of 5 by Sherry from The Red I Treasure Most I always have a hard time looking for a red lipstick for my skin color because red can look overwhelming. I’m a mix race between mostly Asian and white, so I had to balance between yellow and cool tones. I also have a little bit of rosacea on my cheeks so I don’t want to make my face to look even more red. Kyoto Red Lipstick was PERFECT!!! It’s a lovely color with a slight pink under tone. The structure of the lipstick helps me trace my lip line much easier than a typical pointed lipstick. I love love love Kyoto Red! Words can’t express it! Rated 4 out of 5 by Courtney from Amazing This is a a beautiful, beautiful color. I am fair skinned, and almost never wear red lipstick because I have found it makes me look startled. This warm, vermillion shade is perfect and feels so much more natural than any red I have ever tried. The downside is that I find myself having to reapply it often when I do wear it - since it is such a bold color, when it comes off while at dinner (wine glass, etc.) it's noticeably faded. This isn't a problem for me in terms of longevity, because I wear it infrequently (maybe only weekends at night) but this may be problematic for frequent users. Otherwise, it is such a pleasure to use - the texture is amazing, the color is beautiful and the tube is heavy and luxurious. Rated 5 out of 5 by Sasa from THIS IS THE PERFECT RED LIPPY! I've been on the search for the perfect red lipstick, when I'd read reviews and the feedback that it was a red that suited all skin types so I had to try it and it didn't disappoint. This lipstick gets a 10/10 rating due to packaging box, canister, embossed bullet. Ok, now I apply an invisible liner then the colour, perfection and it has great lasting power. I got 4 hours before reapplying and I had a few sips from my drink bottle in between, it did leave a slight tint. The texture is quite creamy in application and there is a high amount of moisture even though the colour is set. I'm medium skin tone with gold undertones and this red is neither to warm or too blue. It'll add instant glam with a few swipes, I'll be making this my go to red lippy! Rated 5 out of 5 by Gwenn from Fabulous lipstick I never wore red. Thought I was far to old to start. Feared it would make my lips look obviously wrinkled. Feared it would make my teeth look yellow. Feared it would find every line around my upper lip and on the sides of my mouth and instantly all of it would end up there. I knew it would make a wonderful holiday gift for a much younger woman. I ordered it. I gifted it. She loved it. It looked so beautiful on her. The texture, the color, the finish, everything was perfect. So I had to try it. After all she is family. OMG to my total amazement and everyone else's as well it actually looked pretty darn great on me. So much so I had to order myself one. Who knew how much a fabulous red lipstick could modernize a pair of jeans and a t-shirt on a women of 65? Awesome surprise! All my fears turned out to be nonexistent. So don't let your age or what we think we can or can not pull off stop anyone from giving this a try. I think it just may give you a whole new attitude. It certainly adjusted mine! Rated 5 out of 5 by Mary W. from Long-lasting and hydrating I had given up on any lip color because I find them too drying. When I heard this was a matte red that wouldn't leave my lips parched, I had to give it a try because I love all the other TATCHA products I've used. When this package arrived, it was truly like a gift on my doorstep--the box, the beautiful card inside, the way the lipstick bullet is faceted like a jewel. Right now I'm only using one side of the bullet because I want to keep the chiseling on one side :) The lip color goes on my lips like a dream. After a night of going out with friends, the color stayed beautiful for over 4 hours and I didn't even need to reach for my lip balm at all. This my new go-to lip color... if only I could order more! 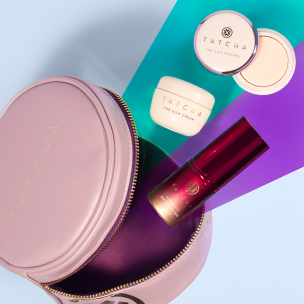 We worked with makeup artists and chemists from the Tatcha Institute in Japan to create a texture and color that would truly become a go-to classic for modern women everywhere. I have this lipstick (it&rsquo;s the best ever - really). However, I was just diagnosed with celiac disease. Is this product gluten free? Thank you for your question! Unfortunately, this treasure is not among our gluten-free options. 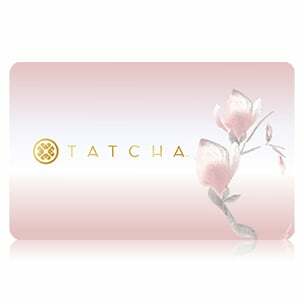 For a list of gluten-free items within our collection, kindly reach out to info@tatcha.com and our team will provide one for you. We hope this helps! Is this lipstick scented, or does it have a fragrance? The Kyoto Red Silk Lipstick is unscented and fragrance-free. What makes this lipstick different from other red lipsticks? This lipstick combines luxuious ingredients like pure silk and nourishing botanical oils to provide anti-aging benefits while instantly illuminating the face. This unique formula is long-lasting, yet leaves lips hydrated. Warm and cool-toned red pigments create a red shade that looks beautiful on all complexions. 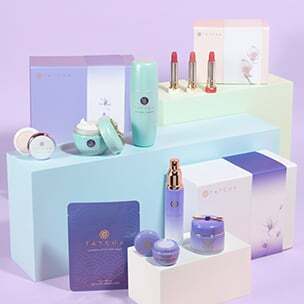 As always, we stand behind our Happiness Guarantee and invite you to contact one of our Skincare Specialists by emailing info@tatcha.com or calling (888) 739-2932 ext 1. to easily resolve any concerns with your purchase. This lipstick has a matte finish.